A listing for a Star Wars Jedi: Fallen Order t-shirt went up on Amazon ahead of time, revealing the first piece of actual game art. The listing, which as since been removed, was spotted by Wario64. Though it is not clear if this is the game’s keyart; i.e. the art you’ll see on the cover and in related promotions, or just a random piece of concept art. All that said, this is the very first one we’d seen for Fallen Order, if you don’t count this image of a Lightsaber. The shot is very Star Wars, showing – presumably – the game’s hero wielding a Lightsaber, and accompanied by a droid. This could be an indication that the droid will be your companion in the game, or at least plays a significant enough role in the story to be featured in the art. It’s certainly scanning something. The two are on some kind of snow planet where the carcass of a crashed Acclamator-class assault ship, or possibly Venator-class Star Destroyer can be seen. Either ship would have been popular in that Era of Star Wars. Interestingly, though, we see TIE Fighters in the distance. TIE Fighters entered service a few years after the events of Revenge of the Sith, so this could indicate the story is set a few years later than we originally assumed. 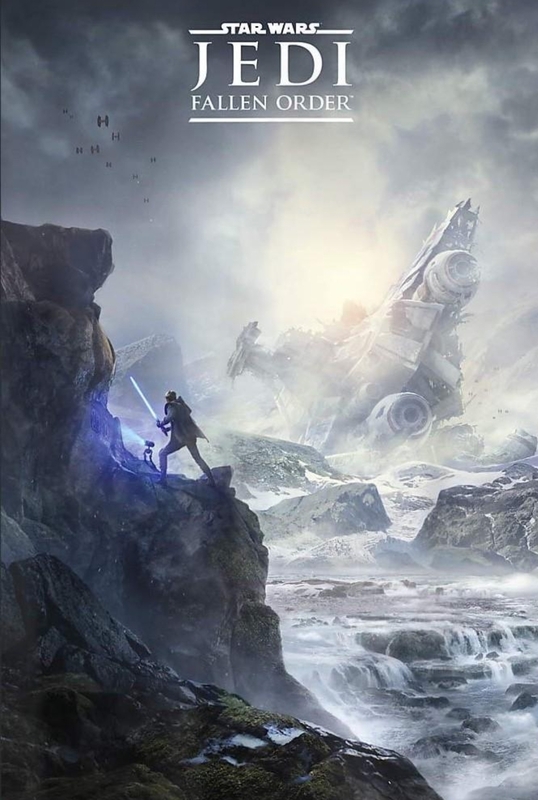 Star Wars Jedi: Fallen Order will be officially revealed this Saturday at the Star Wars Celebration in Chicago. We hope at least some of these questions will be answered there.